A British cardinal encouraged Christians to overcome the “three enemies of ecumenism” and to pray for the progress of closer unity. 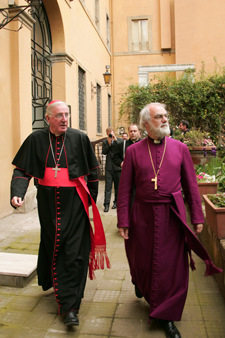 Cardinal Cormac Murphy-O’Connor, retired archbishop of Westminster (pictured right with Archbishop Rowan Williams), said “suspicion, inertia and impatience” had damaged the ecumenical project. The former co-chairman of the Anglican-Roman Catholic International Commission also told about 500 worshippers gathered in the Anglican cathedral in Chester that prayer and grass-roots initiatives were the best means of keeping the ecumenical dream alive. “To mend the ruptures of the past is a task that devolves on each one of us here this evening,” the cardinal said at the service for the Week of Prayer for Christian Unity on Jan. 22. “For too long we have lived, as it were, apart, and one of the joys of my years as a priest and bishop has been the growing friendship that has come amongst us,” he said. This article also appeared in print, under the headline "Unity Building," in the February 13, 2012 issue.